Polbase - Reference: Crystal structure of Pfu, the high fidelity DNA polymerase from Pyrococcus furiosus. 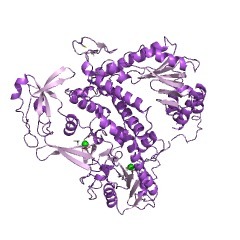 Crystal structure of Pfu, the high fidelity DNA polymerase from Pyrococcus furiosus. We have determined a 2.6A resolution crystal structure of Pfu DNA polymerase, the most commonly used high fidelity PCR enzyme, from Pyrococcus furiosus. Although the structures of Pfu and KOD1 are highly similar, the structure of Pfu elucidates the electron density of the interface between the exonuclease and thumb domains, which has not been previously observed in the KOD1 structure. The interaction of these two domains is known to coordinate the proofreading and polymerization activity of DNA polymerases, especially via H147 that is present within the loop (residues 144-158) of the exonuclease domain. In our structure of Pfu, however, E148 rather than H147 is located at better position to interact with the thumb domain. In addition, the structural analysis of Pfu and KOD1 shows that both the Y-GG/A and beta-hairpin motifs of Pfu are found to differ with that of KOD1, and may explain differences in processivity. This information enables us to better understand the mechanisms of polymerization and proofreading of DNA polymerases.